CSF stands for “community sponsored fishery.” It works much like a CSA (community sponsored agriculture), in which you purchase a “share” in advance and receive weekly deliveries. (We pick ours up at the Sarah P. Duke Gardens.) The advantage for the fishery is that they are guaranteed a certain level of income. 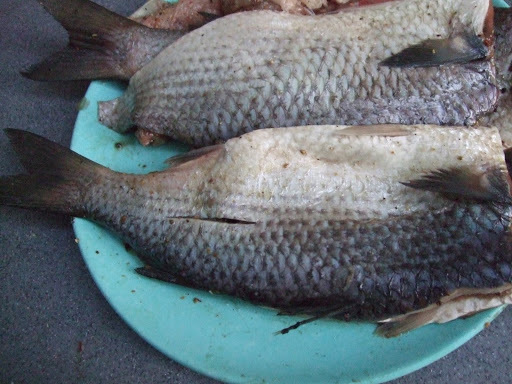 The advantage for us is fresh fish at a decent price. For $11.67 per week, Fred and I receive between 1 and 2 pounds of fish, or roughly $7.78 per pound. The side dishes are mashed potatoes with roasted squash, zuchhini, onion, and tomatoes. But those are unimportant. The important thing here is that the fish is GRILLED–deliciously, beautifully, wonderfully grilled. My days of embarassingly inept grilling may be drawing to a close. Thanks to a Saturday spent watching my friend Bebe, an expert griller, prepare salmon, I quickly discovered a painfully obvious reason for my failures. I was excited when Bebe invited me over for fish one Saturday, and even more excited when I realized I’d have a chance to watch someone who knew what she was doing work the grill. I had planned to watch her technique closely: how she laid out the fire, whether or not she covered it, how much she opened the vents once lid was put on. I stood in her backyard, wine glass in hand, ready to take notes as she gathered her charcoal and implements. Then she put a pile of charcoal on the grill. A big pile. So for the mullet, I got me a big pile of charcoal–roughly three times what I’d been using before. I completely filled that damn starter and fired ‘er up. And the mullet was great. 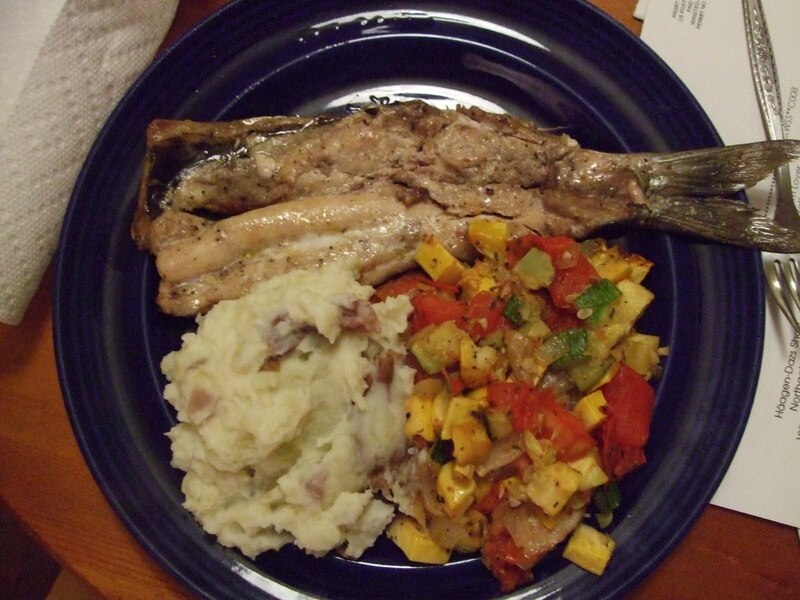 This entry was posted in Durham Food, Fish and Seafood, Grilling. Bookmark the permalink. OHHHHHH… I hate to take exception, but self lighting coal is a HUGE mistake. It has chemicals, that continue to burn throughout your cook. Those chemicals will flavor your meat. Think of it like a smoker. People will cook with different woods because it flavors the meat differently. A Pecan wood cooked fish will taste different than a Hickory wood cooked fish. Just that little bit does flavor different. The chemicals in a self lighting coal will flavor just as much as a wood will (and there are thousands of smokers that know wood flavor matters). I know you are just getting your feet wet, but bad techniques starting early can become bad habits. Buy a chimney starter. In the long run, it will save you a great deal of money (even over using the propane starter option… propane really does cost money. One tank costs twice the price of a chimney starter). Just a bit of paper (I use the Kansas City SPorts section, all it is good for) and your coals will start fine, with NO lighter fluid and NO chemicals. It just takes about 10 minutes longer to get your fire started. Thanks for the tips! I guess I didn't make it clear, but I did use a chimney starter all along. The problem was that I was filling it only about half full. But now I will definitely avoid the self-lighting charcoal!